Remember Donald Trump on "The Apprentice" a few years ago? All I can say is that guy used to make employment terminations look good! Seemed so easy, so simple, and so right to the point as long as you were wearing a tailored suit and were seated in an immaculate looking conference room. In reality, employment terminations don’t start and end within 30 seconds. Nor do they usually end with an empathetic employee that just “understands” the decision and is motivated to moving on to the next step. Most terminations are far from simple and easy, but necessary in managing a business. I would love to say that every employee makes the right decisions, performs at optimal levels and excels with motivated excitement in the workplace, but that just isn’t true. Sometimes it becomes inevitable for an employment relationship to end, and often times it’s the employer who has to play the role of the bad guy in a workplace breakup. Living and working within the great State of Idaho means employment is by law at-will. Legally this means an employer (or an employee, for that matter) can terminate employment with or without cause and with or without notice. Pretty open and flexible for both employees and employers, no? This shouldn’t be construed that employers can let employees go whenever they want to and without careful planning, or that legal issues won’t arise from the way an employer manages a termination. Every termination or potential terminations should be carefully considered and planned to ensure it is being managed properly. I know that's easy for me to say, being an expert on the subject, but in truth terminations don’t have to be so hard. They can be done in a fair, consistent, and diplomatic manner. Termination meetings should ALWAYS be held in a private and confidential setting. The information relayed in a termination is on a need-to-know basis. Termination meetings should be held early in the day if possible. Making an employee work through a full shift isn’t fair or considerate in most cases. Despite the circumstances, remember that your employees are people too and keep in mind how you would like to be treated if the tables were turned. Stick to the facts. Start of by making sure you have facts, documentation, policies/procedures and evidence to support your decision. Hearsay won’t be helpful during the meeting or after they are gone, so make sure you have the right information going into the meeting. If the termination involves a specific incident or behavior, get the employee’s side of the story. This allows you to gather insight on items you may have been unaware of or not even considered. This has been a game changer for me in situations when employees had sometimes no other options or courses of action to take in certain situations. Bring tissues – but make sure to check the emotions at the door. Emotions are high with employment terminations on both sides. Inserting emotion into an already difficult situation only complicates the meeting. Assert your position but try to be empathetic and make sure to steer clear from drawing in any emotions or personal feelings. Mean what you say and say what you mean. Remember, the employee is more than likely going to be defensive, so choose your words carefully. They also may handpick statements made in the termination meeting for action against the company, so be mindful of the long-term impact of your words. Ensure the decisions you have made regarding the termination will be uniformly considered/applied to similar situations in the future. Make sure you are compliant with your policies/procedures and that in similar situations in the future you are committed to taking similar actions. If you are making individual specific decisions based on common performance issues/behaviors, you could end up with future legal issues by playing the nice guy with an employee or two. Document the termination meeting with all the relevant facts. Ensure the employee is able to read the termination notice and, if willing, sign the notice alongside the management member who handled the situation. Break-ups are never easy – and workplace break-ups are no exception. Unlike the end of a personal relationship, the way a termination is managed can have a long-lasting impact on a company and may even be accompanied by unemployment claims or worse. If you need help, there are helpful professionals (HR managers/professionals, consultants, even attorneys) with great insight to share. It’s worth the time and money you may have to spare to make the right decisions for you and the employee. 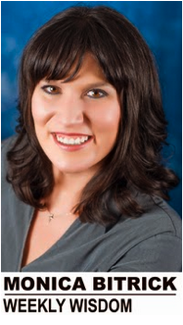 Monica Bitrick is a human relations consultant who lives and works in Idaho Falls.